You've decided to purchase a new car, or maybe it’s just finally time to update that one you’ve had since college. While the process of selecting a new vehicle is an exciting one, it can also be a little stressful or even daunting. Here are 5 tips to help make the experience a little simpler. Like any major purchase in your life, it’s important to figure out what you can actually afford. Sit down and determine how much you are able to pay each month, including the car payment, loan interest, and insurance. You should not be spending more than 10% of your monthly income on your car payments. This will be helpful as you begin applying for loans. There are hundreds of options out there when it comes to selecting a car. Everything from the make and model down to the color and year is a decision that you will have to make. After setting your budget, make a list of features you would like in a car and filter your searches accordingly. This is also your chance to compare prices at different dealerships as well as new vs. used. While you may not be able to purchase that dream Ferrari just yet, there’s no reason why you shouldn’t be able to love your car. Don’t forget about the free Cyprus Auto Tools available to you during your search. It’s usually best to walk into a dealership with an approved loan from your local credit union along with your budget. This will help prevent salespeople from showing you vehicles that you cannot afford. If you do choose to get financed at the dealership, remember to ask for Cyprus. We have partnered with hundreds of dealerships around the state of Utah to help get you the best rate possible. A vehicle is a HUGE investment and you’ll want to make sure that you are 100% sure of your choice, especially since most car sales are final. Take as much time as you need during the test drive. Experiment with all aspects of the vehicle, both while parked and driving, to make sure that you’re comfortable. At this point, you may realize that there are features on your ‘wish list’ that you don’t really care about after all or, that there’s something else you would like. Be confident. You’ve done your homework and now it’s time to get that car. Don’t allow yourself to be pressured into something you don’t want or is outside of your budget. Never negotiate down from the sticker price, start up from the invoice or wholesale price. Make sure you show that you are well informed, but don’t come across as argumentative. 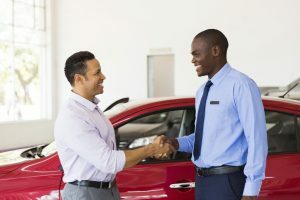 Finally, don’t ever feel like you HAVE to purchase a vehicle once you’re at the dealership, even if the paperwork is drawn up and just waiting to be signed. If something doesn’t feel right, walk away, this may be just the thing to show the salesperson that you mean business.